Full RV service and repairs. Your site or ours. The whole point of owning an RV is that you can use it to explore life on the open road. But what happens when your RV is grounded because it needs servicing or repairs? 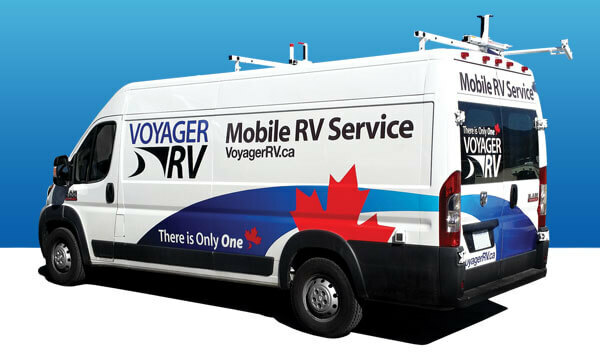 Voyager RV, The Kelowna RV service experts have just the thing to get you up and running again: mobile RV service. Whether your RV is in Uncle Joe’s field and you simply need an oil service, or your brakes were acting up on the way to your favourite weekend spot, Voyager RV’s house calls offer the height of convenience. Dont wait until you want to use your RV, Click here to book your Mobile RV Summerize Special Today. If you’re buying a used RV with a propane system having it gas tested will give you the peace of mind your RV meets provincial saftey regulations. Voyager’s mobile service is backed by an extensive parts store that provides everything needed to repair gas, plumbing and electrical systems, as well as the latest RV and camping accessories. What RV Service Work do you Require? *Eligible Mobile RV Service territory is from Armstrong - to - Peachland.